Be Gentle with that Toothbrush! Are you more of a tooth scrubber than a tooth brusher? Do you brush with more aggression or force than you should? Chances are you do but you may not be aware. The next time you brush your teeth, pay attention to the level of pressure you’re exerting onto your teeth and gums. You should be brushing gently, and with a soft bristled toothbrush, even if it may not feel like you’re getting as an effective clean. You could be wearing away your teeth. Brushing with too much force is known to wear away at the precious tooth enamel (surface layer), which we need for life! Enamel wear often leads to an increase in tooth sensitivity, as well as discolouration or yellowing of the teeth. Be kind! You could be causing gum recession. Aggressive brushing is a really easy way to cause gum recession. Your gums shouldn’t be butchered with your toothbrush every cleaning session, or they’re going to start pulling back from the teeth. Gum recession is both an unattractive and unhealthy oral condition, but there are definitely ways to prevent and even treat the problem. Our Milton dentist agrees that the best thing you can do to prevent recession is to brush gently, floss daily, and see your dentist and hygienist regularly. You’re going to need to replace your toothbrush more often. If you’re brushing too hard, your toothbrush bristles are going to wear at a much faster rate… and who wants to have to replace their toothbrush more often than they need to? Brushing gently will not only give you just as effective of a cleaning, but will preserve your toothbrush bristles for longer. Another bonus! Are your teeth in need of a cleaning? 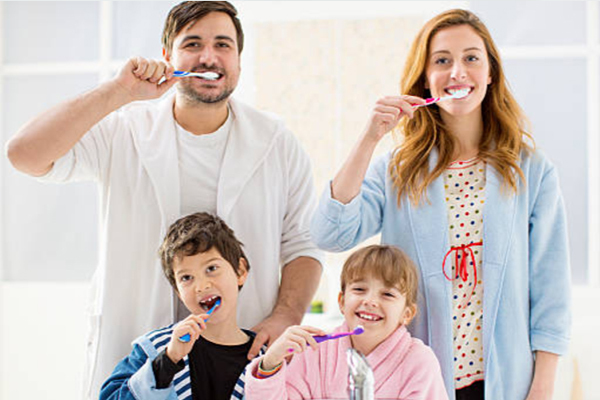 Aside from brushing gently twice a day, it’s also important to maintain a clean and healthy smile by visiting the dentist and hygienist every 6 or so months. How long has it been since your last cleaning and check-up? If you’re due, our friendly dentist would love to see you! Call us today to book an appointment.